This for sure would be great. But if so....keep just one eye shut and the other keep it wide opened. Science said many stupidity in therms of taxonomy. Some historical! I never mannaged to get pure Dyckia goehringii seeds as I had just two plants and they wers the very same plant. Now I ´ve got five new collect ones. Here it is a very slow growing species and prresent just one very same look. Viçosa Federal University is studing this plant with much care now. All in all this is one of the ten top Dyckias of all. It is really exciting to see the growth of this rare species from seeds! GerFi, please do keep on putting news pictures for your seeds. Constantino, you could use some photo softwares to adjust the size of your picturs, such as Adobe Photoshop. You know, all of you pictures are so dangerous that I have to keep away! I crave the big photos! Those that show details. I just sorry I can´t sent them any larger. Photos are to clarify, to remove doubts, photos are to see. They are not for guessing, keep on wondering. Pictutes are great specially when they fulfil their purposes and when big, really Big. Those we have in our driver´s license are out of any question. Well, this is not that big picture I intented it to be but still is a very elucidative one. 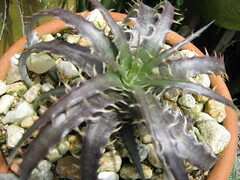 Dyckia goehring bears so minute scales it seeems the plant was waxed. These scales are used to reflect the Cerrado scorching Sunlight. 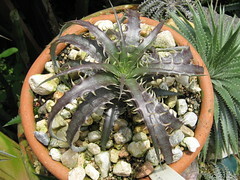 This Dyckia loves high intensity UV rays incidence. The scale for UV radiation goes from one for the lowest incidence to fourteen as the highest possible degree of UV incidence. Some Dyckias as this one like it above 8. When we deal with Cerrado native Dyckias light gets a new meaning. Not just the amount of day hours but the quality of the light decides if the plant is going to be gorgeous looking or just a drab faint poor sad looking one. Dyckias are extreme Sun lovers and every detail in their anatomy and physiology is fit for coping with light and heat. Spines, for instance, they are there to dissipate heat, preventing the plant from being boiled and not for protectiona agist rodents and other animals. Plants in general love animals and rely on them in order to survive. They atract them. Them get colorful, sweeter, even delicious goo tasting. Those hooks on Dyckia goehring are for surviving on almost bare stones when the Sun is at its most. Ina general way we are just beging to understand our native plants. Today many Brazilian Universities work with some of the most important Universities of the planet in order better know our wilderness. 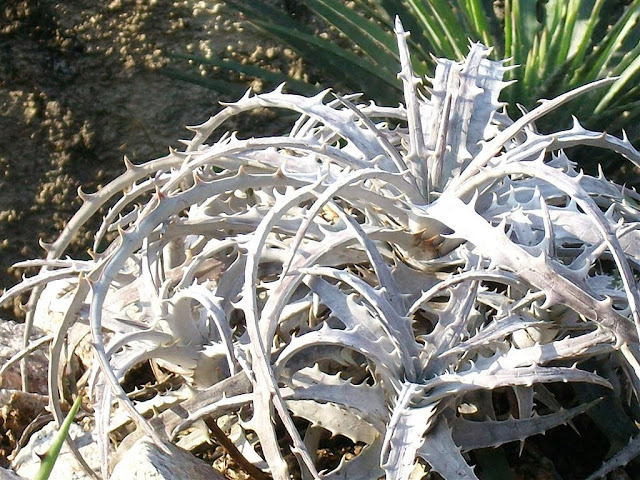 The UNIVERSIDADE FEDERAL DE VIÇOSA is specially studying this wonderful plant, Dyckia goehringii. Knowledge is The Light we can not survive nor go any further without it the very same way Sunlight is the energy Dyckia goehring evolved to rely and cope with. I do believe in knowlege but science still owes us many,many answers. Science still must present us the final answer for cancer, and many human enimies thay prey on us all and take our briliant minds away, our beloved friends and relatives. My passion for plants is not for pleasure alone. We have to understand way down to the deep all we can and this will be a link of the chain that may save us all. The answer Science owes me is within the Knowledge we should already being bearing. welcome at our forum ! I hope You will be enjoyed to visit our Bromelien-Site. It locks a bit different like Constantino's. Maybe it is a Hybrid? But surely not enough sun at all. Isn't Constantino? I'd like to hear about other people who was seeding Dyckia goehringii from BDG-Samenversand. Thank you for your welcome! I am really such a freshman in this filed and willing to be friends with everyone here. Constantino Gastaldi hat geschrieben: look at this seedling of mine from seeds collected in wilderness: This is much like yours. This will be one of your much loved ones, for sure. could you provide an update on how the above has developed? Must be gorgeous by now.